In most U.S. markets, it’s the Pascal family of greenish to pale-green celery cultivars that we’ve become most accustomed to finding in the produce section. Pascal celery is larger than most other celery types, with firm, solid stalks and leafy ends. Yet even within this particular scientific type of celery (Apium graveolens var. dulce), there are many other options including Matador, Red Stalk, Tango, and Sonora. Celery actually comes in a variety of colors from sheer white to vibrant gold to rich red and deep green. 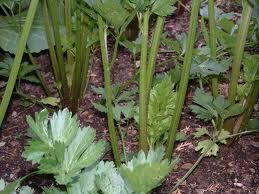 In this genus/species of plant (Apium graveolens) are also found two other important types of celery. The first is celeriac (also called root celery, turnip-root celery, or knob celery). Just like the name suggests, root celery is characterized by a large root ball, which is especially prized for its unique somewhat nut-like taste. (The scientific name for celeriac is Apium graveolens var. rapaceum.) The second type of celery is leafy celery (Apium graveolens var. secalinum), which looks very similar to parsley but tastes like celery! Root and leaf celeries are valued worldwide for their unique flavors and aromas; they are often “main plate” vegetables rather than salad or soup additions. The bigger family of plants that houses celery is what scientists call the Apiaceae or Umbelliferae family. It is also commonly known as the parsley or carrot family. (Just compare leafy carrot tops or parsley leaves with celery leaves and you’ll see why.) In addition to celery, carrots, and parsley, this plant family also includes dill, fennel, cilantro/coriander, parsnip, anise, caraway, chervil, cumin, angelica, and asafetida. For an in-depth nutritional profile click here: Celery. Celery is a rich source of phenolic phytonutrients that have antioxidant and anti-inflammatory properties. These phytonutrients include: caffeic acid, caffeoylquinic acid, cinnamic acid, coumaric acid, ferulic acid, apigenin, luteolin, quercetin, kaempferol, lunularin, beta-sitosterol and furanocoumarins. Celery is an excellent source of vitamin K and molybdenum. It is a very good source of folate, potassium, dietary fiber, manganese, and pantothenic acid. Celery is also a good source of vitamin B2, copper, vitamin C, vitamin B6, calcium, phosphorus, magnesium, and vitamin A (in the form of carotenoids).